Photo (above): US citizen and peace activist Cindy Sheehan attempting to deliver a letter of protest to her own national embassy in Dublin today (March 5th) demanding the release and repatriation to Cuba of the five anti-terorist activists known as the Cuban Five. 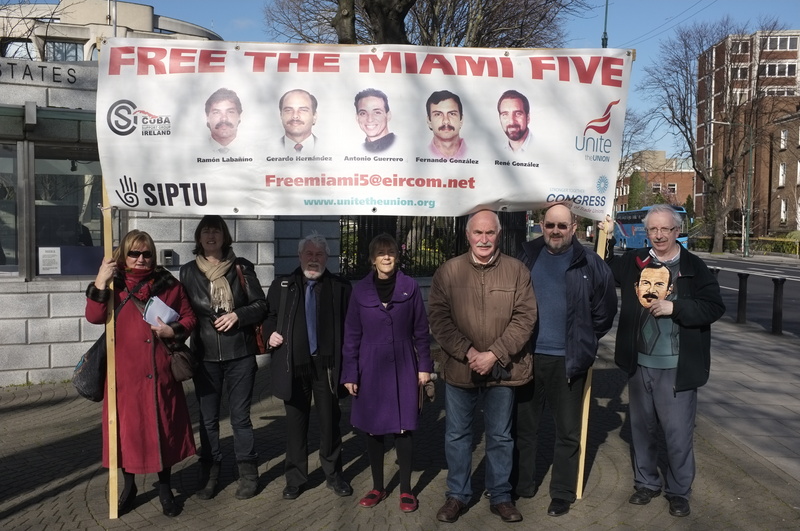 Ms. Sheehan, whose son Casey was killed while serving as a US soldier in Iraq, was in Dublin to attend a number of events to highlight the situation of the Cuban Five who have been in various jails, often in solitary confinement for almost 16 years. She was joined at the US embassy protest by members of the Free the Five campaign and political activists including members of the Workers' Party. Below some of those involved in today's protest including Workers' Party Research Officer Padraig Mannion (right).